These pasties are easy to prepare because you don't need to precook the filling. They taste wonderful eaten hot or cold. Make the pastry first. Season the flour and sift into a large bowl. Add the butter and lard and rub them into the flour using your fingertips until the mixture resembles fine breadcrumbs. Sprinkle with 6-7 tablespoons of chilled water (enough to just bind the dough) and draw the mixture together with a round-bladed knife. Turn onto a floured work surface and knead gently to bring together then wrap the pastry in clingfilm and chill for at least 30 minutes in the fridge. Divide the pastry into 4 equal pieces and roll each one out on a lightly floured work surface using short sharp strokes, always rolling in one direction. Give the pastry a quarter-turn, then roll it again to form a round about 20cm in diameter and about as thick as a £1 coin. Cut into a circle using a plate as a guide. Reserve the trimmings to make pastry initials, if you wish. Divide the ingredients into 4. Arrange half a portion of potato and swede along the centre of a pastry circle. Top with steak then onion, then the rest of the potato and swede. Season each layer with white pepper. Lightly brush the edge of the pastry with water then carefully bring up the edges to the centre to cover the filling. Pinch or crimp between the forefinger and thumb of one hand and forefinger of the other to create a sealed crest over the top of the pasty. Add your initials cut from the trimmings. Repeat with the other pastry circles, place on a baking sheet and chill for 30 minutes. Preheat the oven to 180°C, gas mark 4. Brush the pasties with milk or beaten egg and cook for 1 hour until the pastry is golden and the filling cooked through. Serve hot or cold. 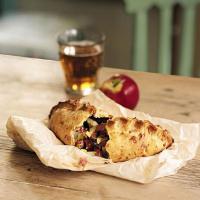 Open-freeze the uncooked pasties on a tray and place in an airtight container in the freezer until required. Thaw completely and cook as above. For cheesy ham pasties, add 75g grated mature Cheddar to the pastry and reduce the lard to 50g. For the filling, use 450g unsmoked gammon steak, cubed, 1 medium sliced leek and a sliced onion. You can also add a couple of chopped, hard boiled eggs. For a sweet version, make the pastry with all butter and add 25g caster sugar. Divide the pastry into 6 and roll out to thin 20cm circles. For the filling, use 600g Bramley apples, peeled, cored and sliced. Divide between the pastry circles and sprinkle each one with a pinch of ground cloves and 25g light brown muscovado sugar. Seal and cook in a preheated oven at 180°C, gas mark 4 for 40 minutes. Serve with Cornish clotted cream.